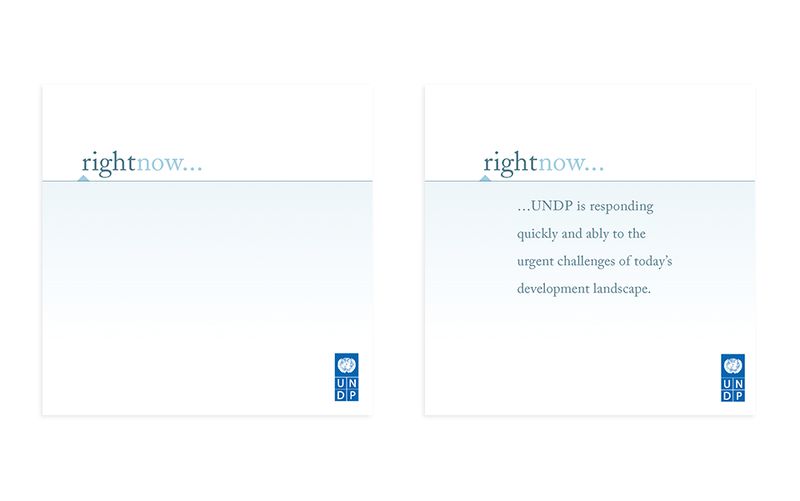 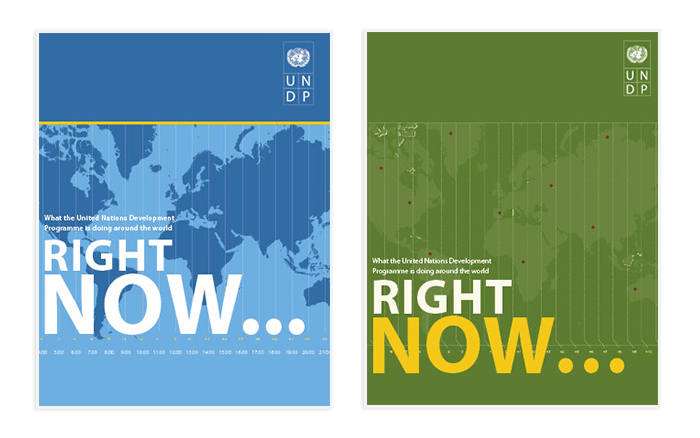 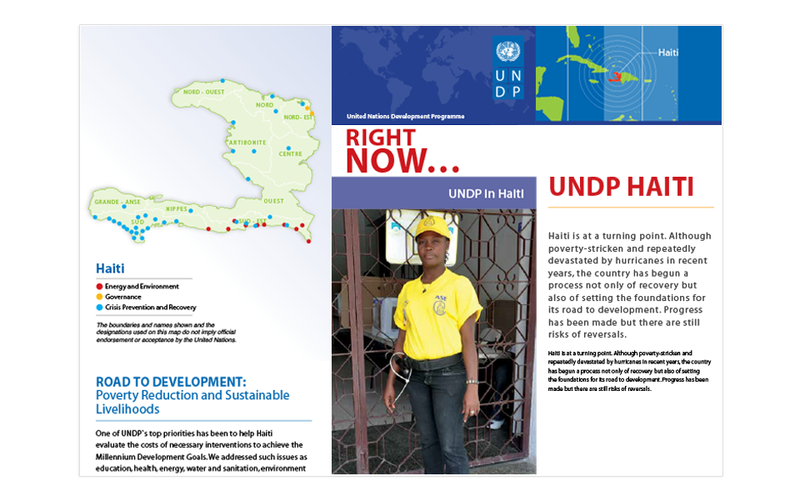 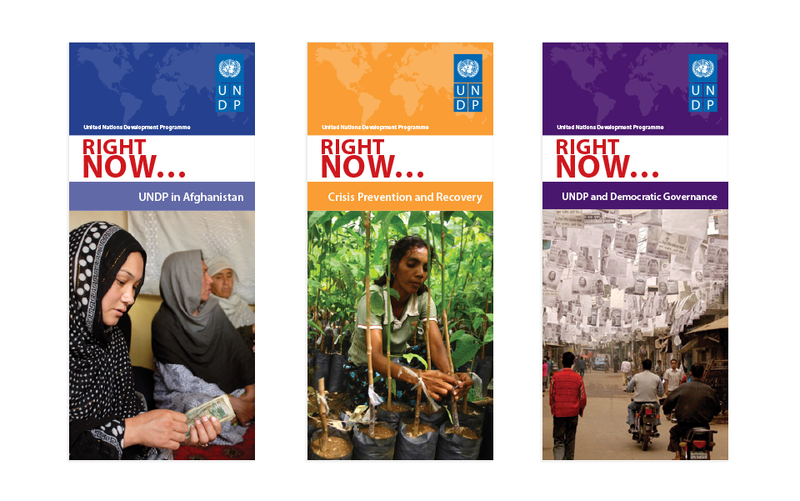 Informatics Studio partnered with the United Nations Development Programme to provide strategic branding and comprehensive design for UNDP RIGHT NOW!, a global communications initiative aimed at increasing awareness of and enhancing access to the UN’s development activities, knowledge and resources. 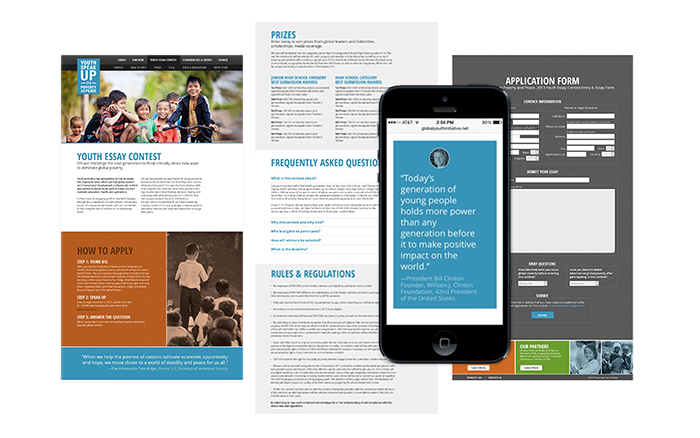 We designed Individual families of communications to strategically engage audiences, ranging from top government officials to international development providers in the field. Our strategic approach results in an integrated, consistently branded look and feel for this multi-year initiative, through the development of design standards that unify and strategically present all program communications and information in multiple languages through a single, strong, UN branded voice. 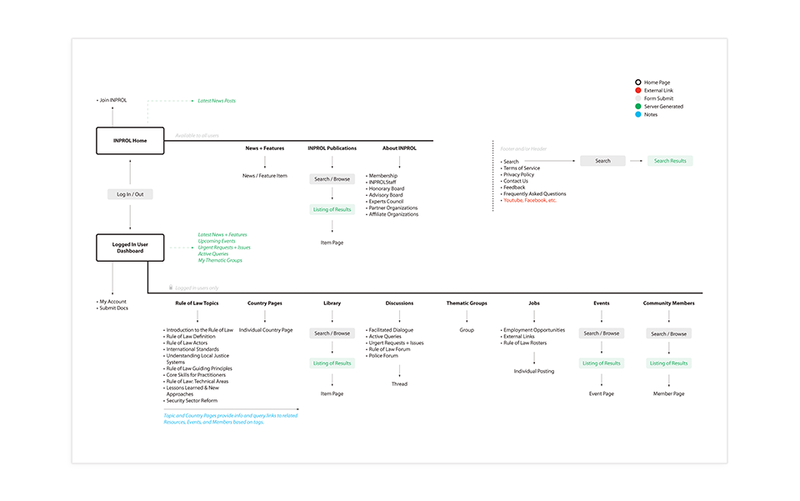 In close collaboration with the World Bank Cybersecurity team, Informatics Studio is providing comprehensive design and development of an integrated cybercrime assessment system. 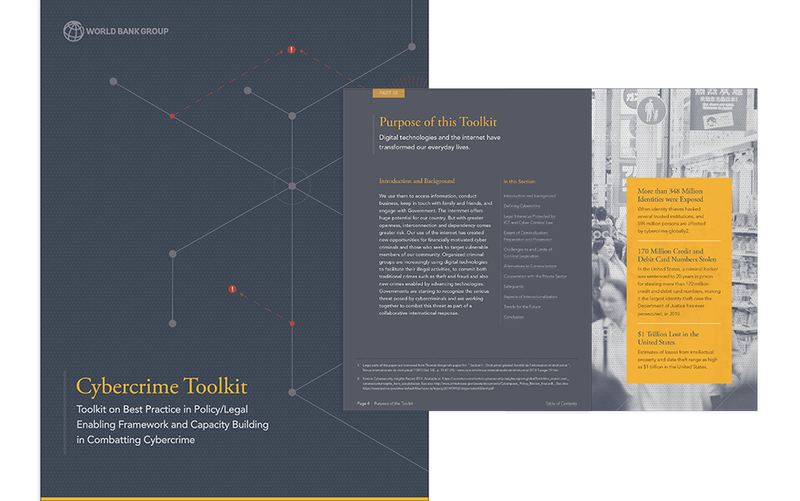 The system includes a 200-page Cybercrime Prevention Workbook, a website delivery platform, and an interactive assessment tool that guides participating countries through the process of self-evaluation. 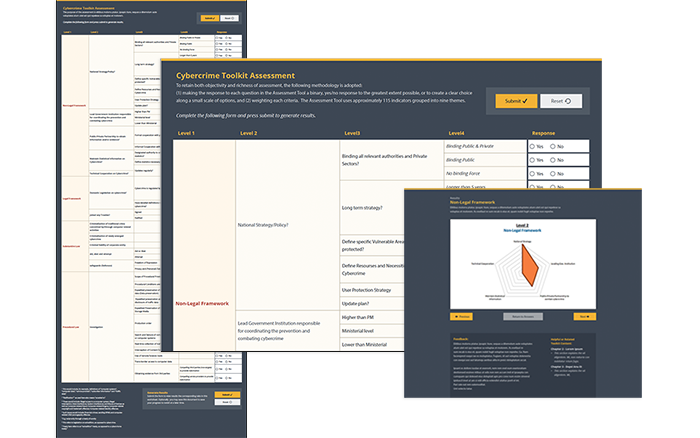 The evaluation is linked to data visualization tools that enable country-based program leaders to clearly illustrate gaps and identify opportunities to improve their readiness to combat national and global cybercrime threats. 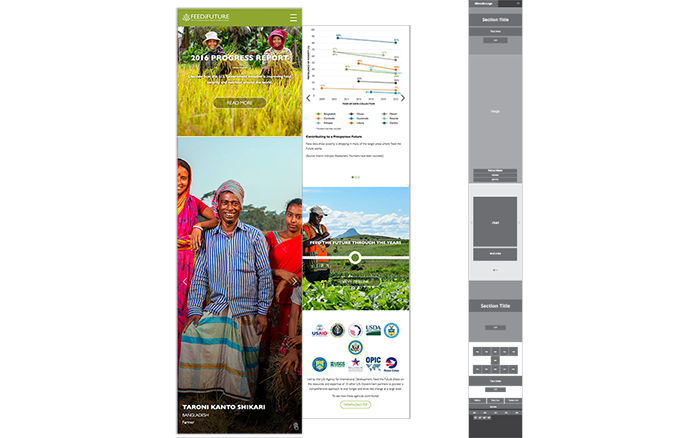 Informatics Studio was asked by Carana, an international development organization, to evaluate existing program management systems and provide strategy, design and development for an integrated web-based platform for delivering knowledge and supporting collaboration to solve complex human development challenges around the world. 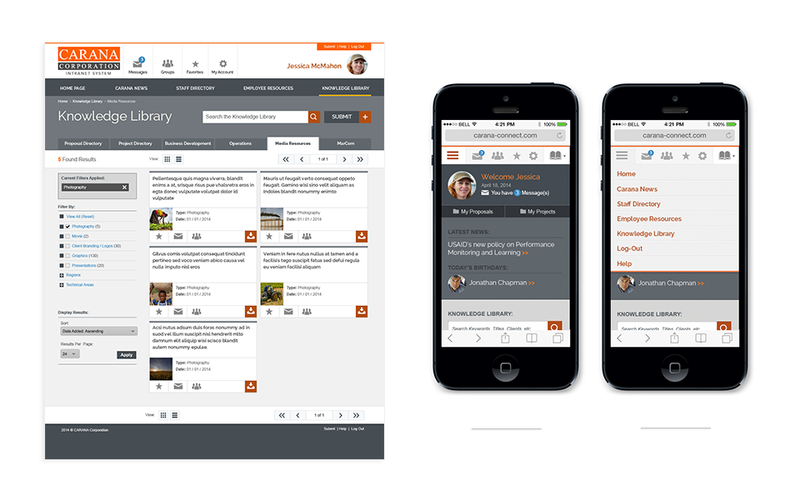 Our streamlined solution provides a single interface to program knowledge and tools to productively capture, organize and deliver of critical information in the field. 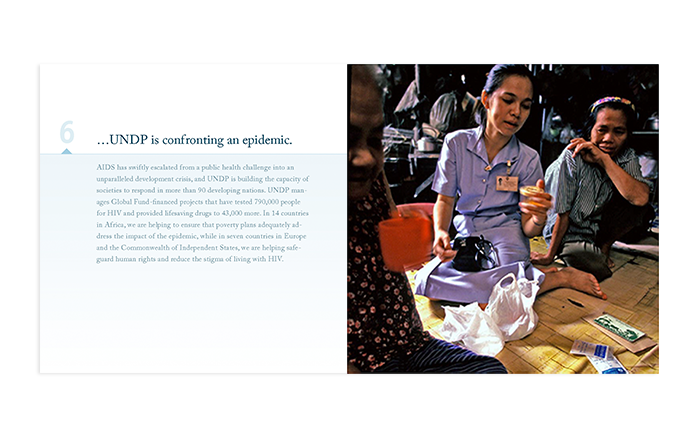 SNV World is the international development agency of the Dutch government. 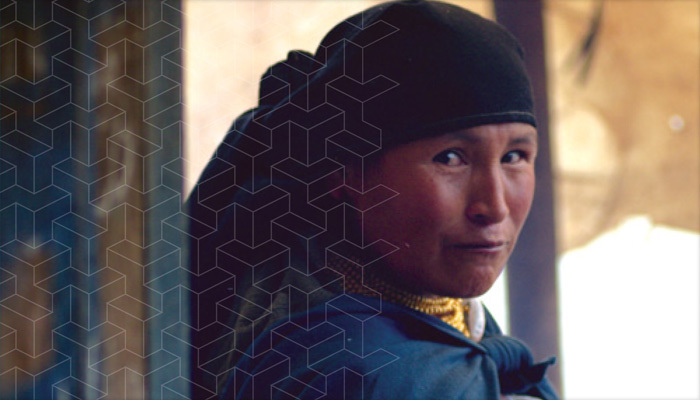 It is an international non-profit organization that started more than 40 years ago and currently works in 38 of the poorest countries around the world, with an aim of alleviating poverty through sustainable and locally-led development. 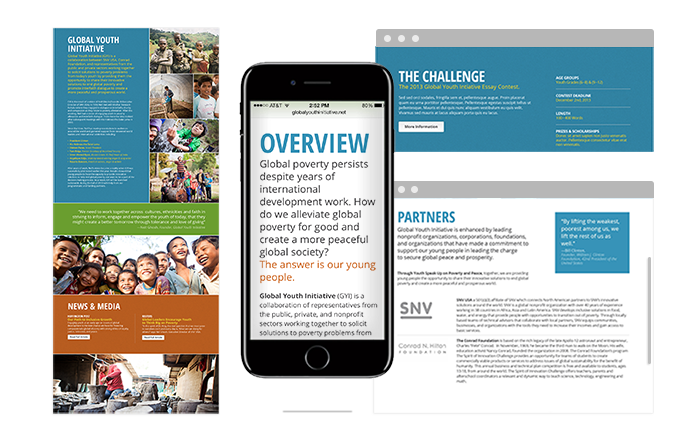 Informatics worked with SNV World to design and develop program branding and comprehensive web and mobile design for the Global Youth Poverty and Peace Initiative, a next-generation leadership development program. 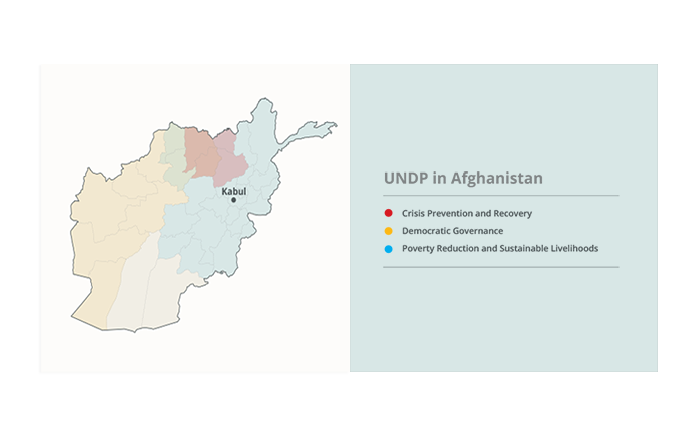 Our strategic approach is designed to support emerging local and national leaders in submitting ideas for alleviating poverty and promoting peace. 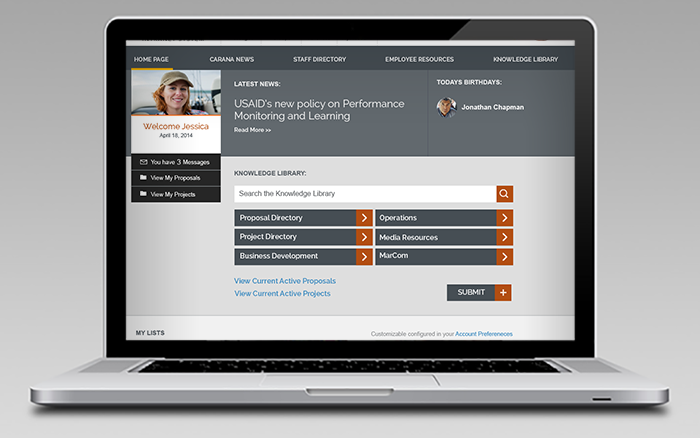 The system is structured to supply program managers with the tools they need to collaboratively review and rank submissions, with top finalists receiving awards ranging from books signed by Bill Clinton to scholarships for academic study. The International Network to Promote the Rule of Law is a program of The United States Institute of Peace (USIP). 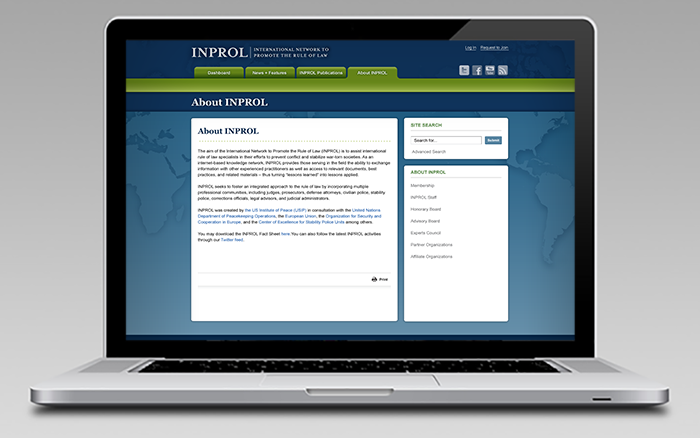 The aim of INPROL is to assist international rule of law specialists in their efforts to prevent conflict and stabilize war-torn societies by supporting direct access to just-in-time training and online expertise locally, regionally and globally. 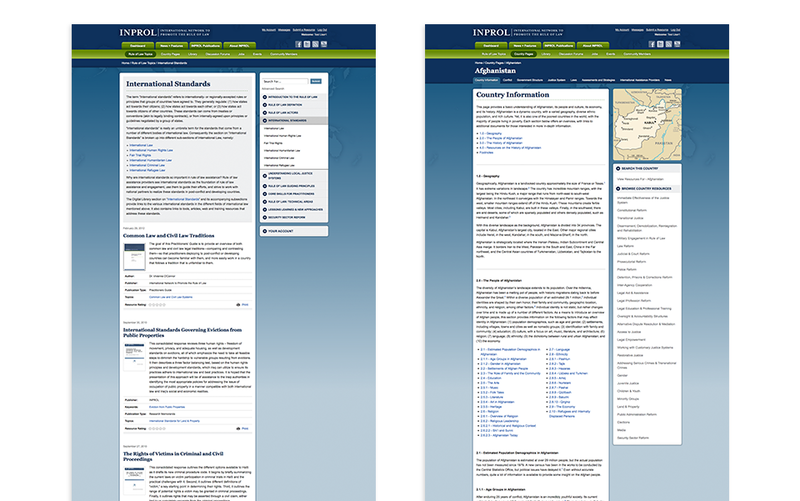 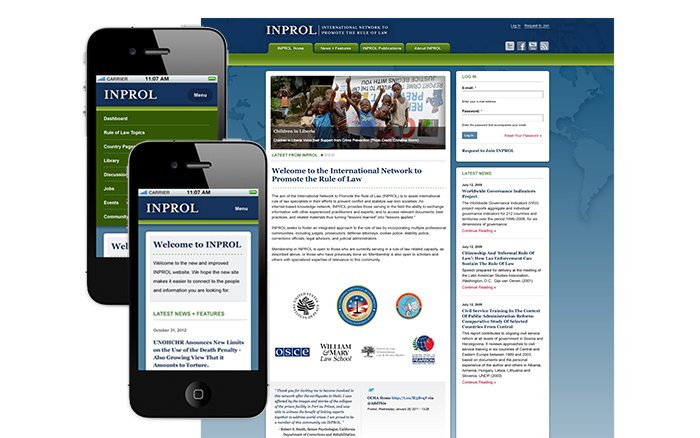 In close collaboration with the USIP team, we provided comprehensive system analysis, mapping, strategy, design, and technical implementation, including system architecture, user-centered front end, usability testing, piloting, and system engineering, with training and ongoing program support services. INPROL has evolved into a resource-rich collaborative framework for those serving in the field to effectively self-tailor their online experience according their own requirements. 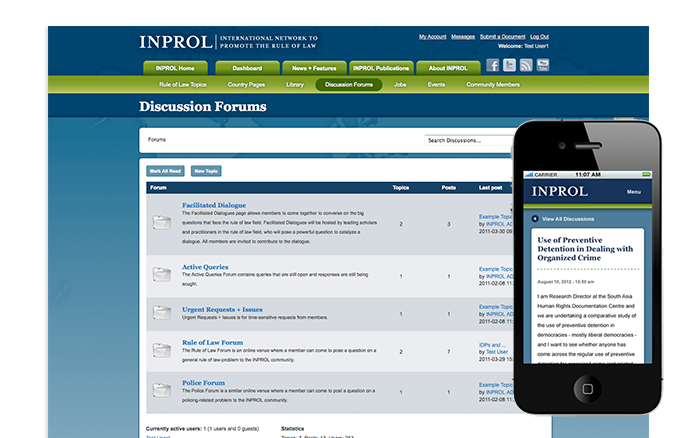 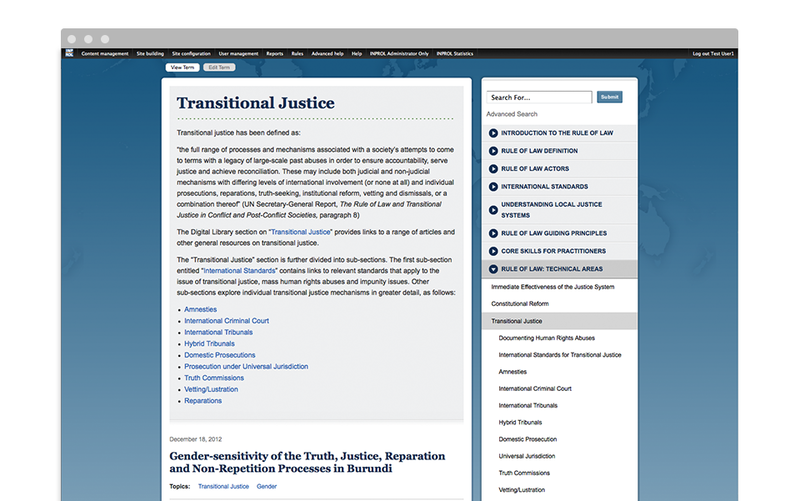 The INPROL platform supports diverse users (law enforcement, military, government leadership, educators, development specialists) around the world in contributing and sharing knowledge, accessing training and informational resources, and finding subject-specific expertise when and where they need it. Through our user-centered approach, program administrators can seamlessly manage, organize and contribute content, facilitate membership and team building, and provide site governance through a well-structured, simple interface to every aspect of the information management system. 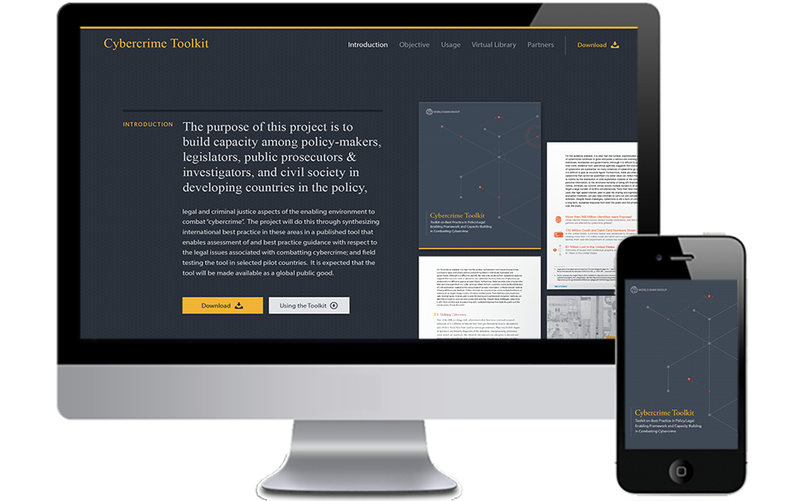 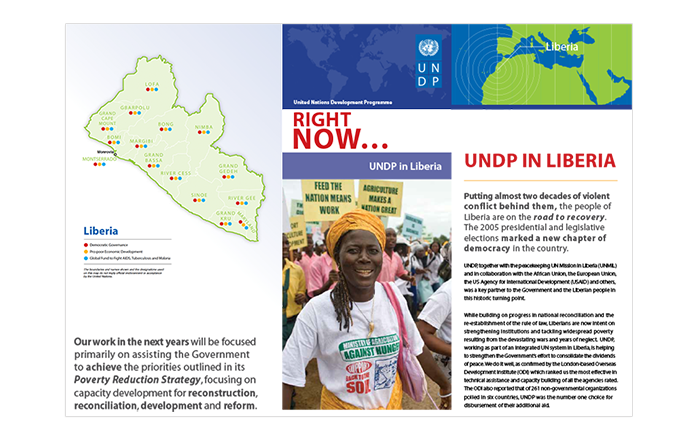 INPROL is strategically designed to support real-time collaboration with local and national governments, practitioners in the field, and experts from around the world in working together to mitigate conflict and lay the groundwork for stability. 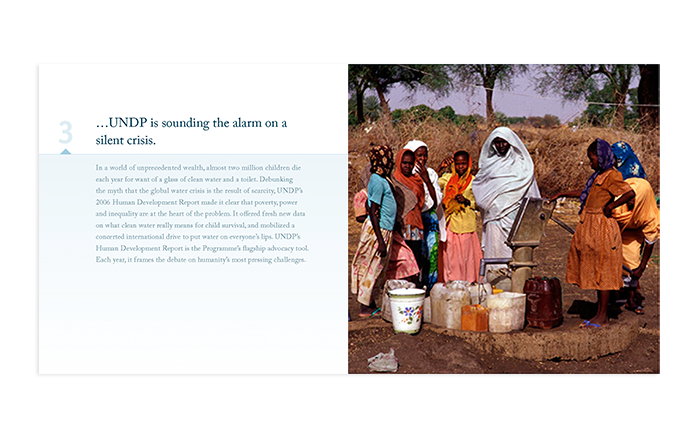 DAI works on the frontlines of international development. 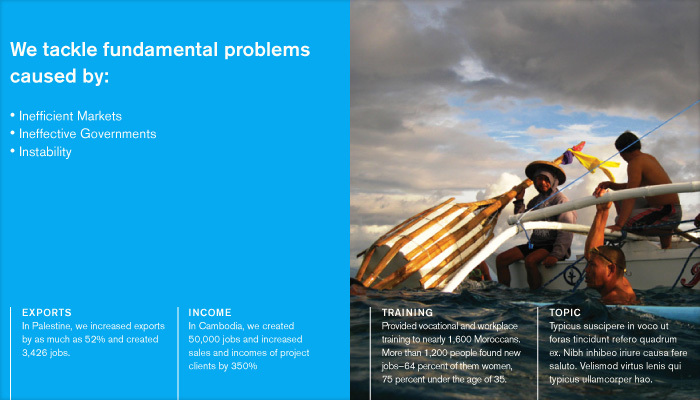 Transforming ideas into action—action into impact. 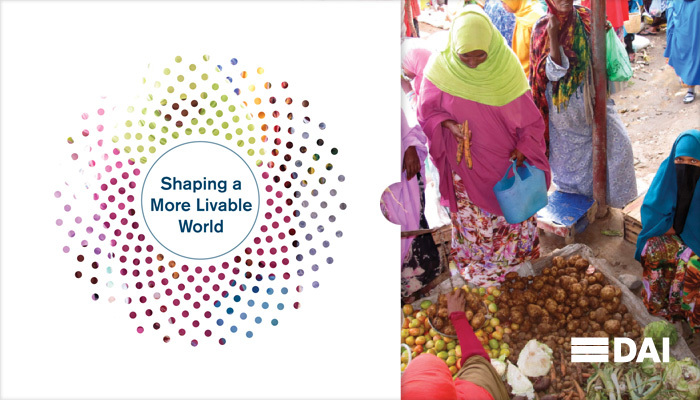 They are committed to shaping a more livable world. They tackle fundamental social and economic development problems caused by inefficient markets, ineffective governance, and instability. 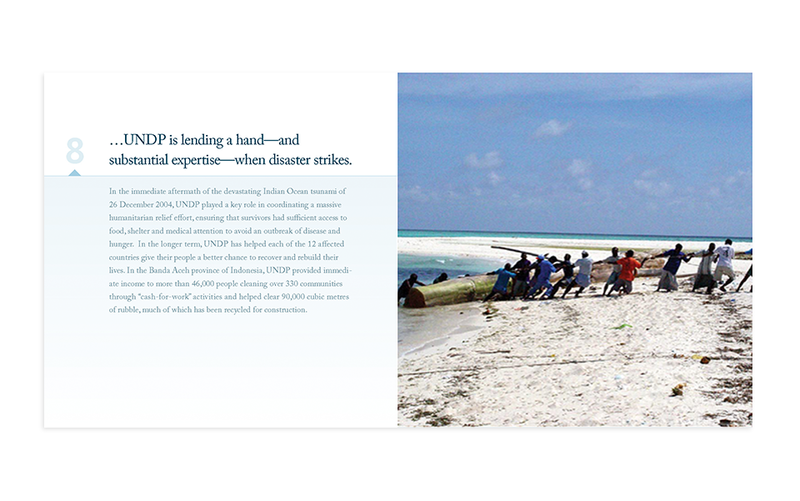 DAI works with a wide range of clients, including national and local governments, bilateral and multilateral donors, private corporations, and philanthropies to solve some of the world’s great challenges through leading expertise in Corporate Services, Economic Growth, Environment and Energy, Governance, Health, Information and Communication Technology for Development, and Stability Operations. 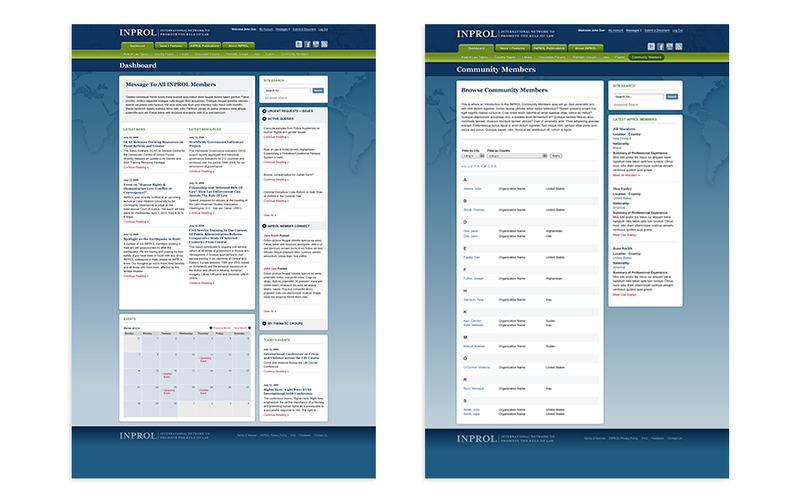 Informatics Studio is designing a range of corporate capabilities materials for DAI, including the in-progress corporate brochure. 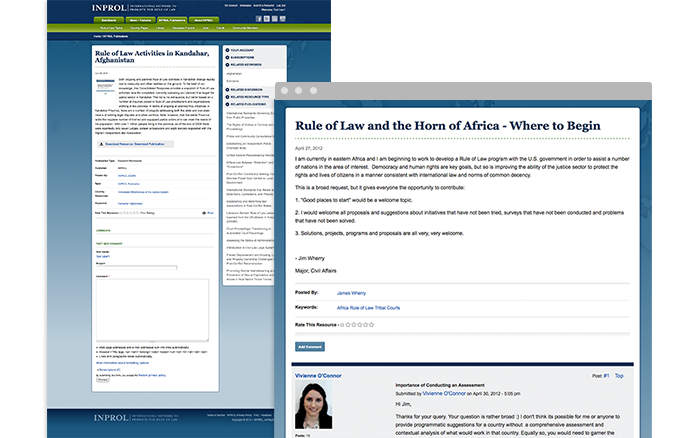 Our approach is aimed at differentiating the company from its competition while creating clear perceptions of their unparalleled expertise, depth of experience, and global capacity. 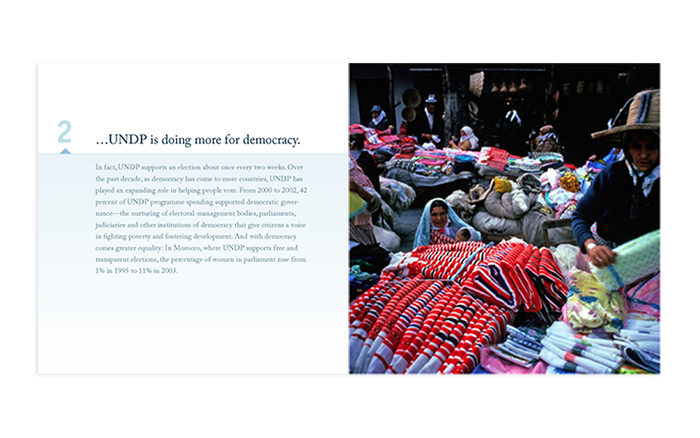 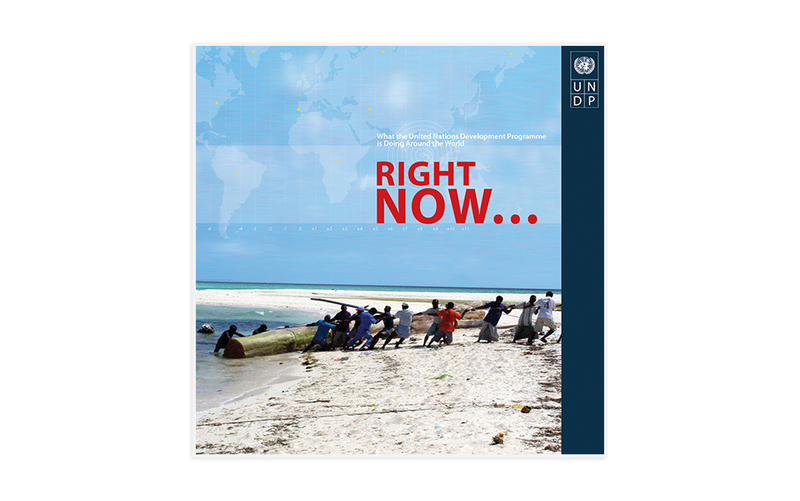 Through the utilization of world class photography, an innovative format and sophisticated strategic visual design, the brochure will encourage DAI’s partners, donors and other stakeholders to understand the company’s unique expertise and abilities in meeting global development challenges. 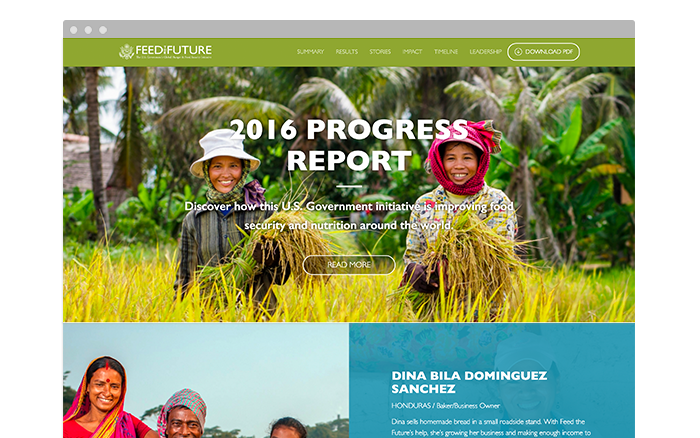 In collaboration with prime contractor, Insight Systems, Informatics Studio designed and developed an innovative website development tool that utilizes a structure based on the yearly progress report for USAID’s Global Hunger and Food Security Initiative: Feed the Future. 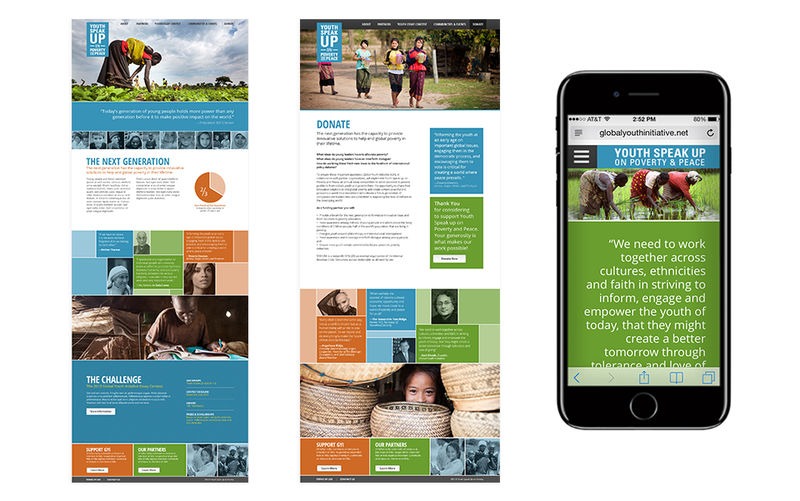 Our innovative solution results in a reusable Drupal Microsite theming framework based on Insight’s core design. Our technical solution provides Insight Systems and USAID with the capability to easily create microsites for future reports, event promotions, or product releases. Utilizing the Drupal Multi-site function, each deployed microsite shares a single Drupal installation while utilizing its own database and configuration settings. 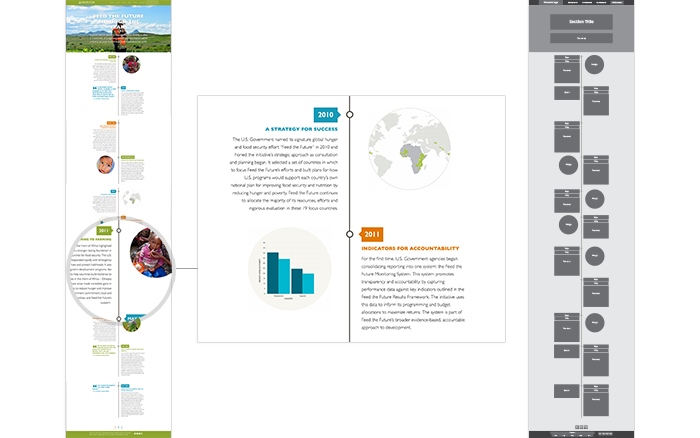 Focusing on how Insight Systems can expand the microsite, we utilized the paragraphs module for creation of all content. 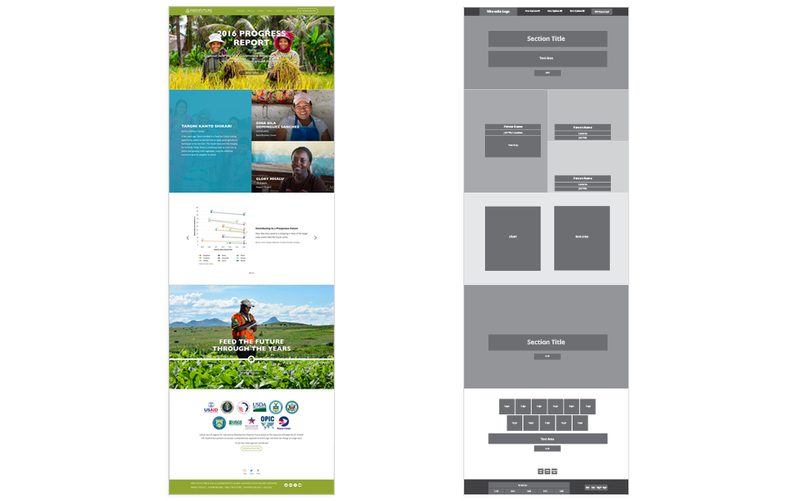 This provides flexibility for development, expedites deployment, makes management of the microsites efficient and less cumbersome, and provides templated design standards to assure the design quality and consistency. 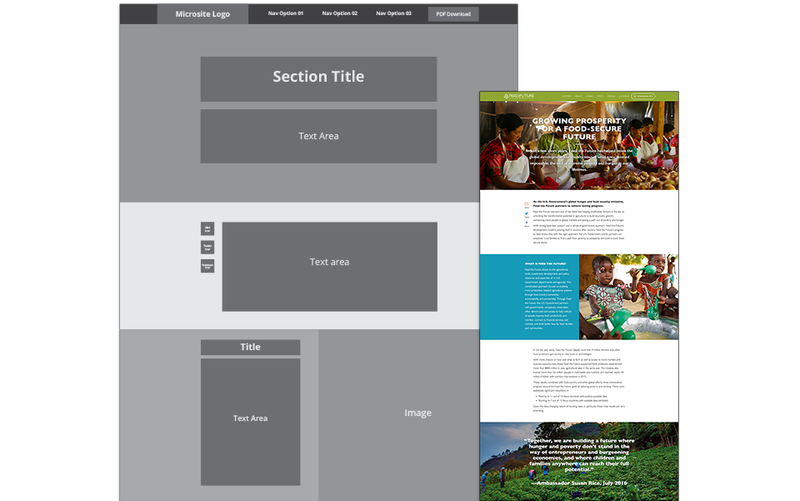 Each Drupal Microsite provides custom configuration of the site’s color, images, and placement of logo. 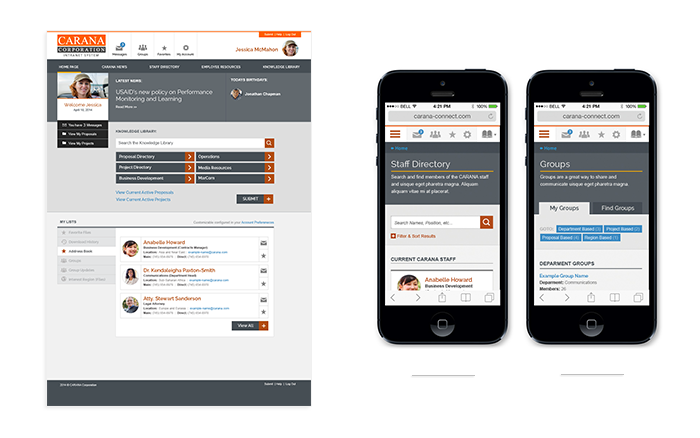 Admin sections and field configurations within Drupal content provide this customization. Other features include custom administration pages, content workflow, domain mapping, parent site searching, and configuration management.